Sapphire is a full coverage royal blue with a silvery shimmer. 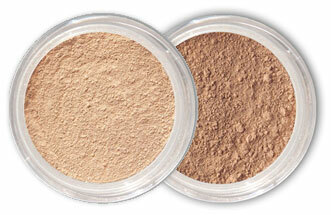 I have bought the mineral foundation for the first time and I am very impressed. In the past I have used other brands, but never have I come accross one that is as good as Mineral Hygienics'. It goes on beautifully, not blotchy at all, with excellent coverage, and it looks natural, not caked on like some of them. What I have found in the past that most mineral makeup will show up my pores, virtually magnifying them, well, I am delighted to say that this one does not do that, and it does not settle in lines. Wears fantastically also. Very happy indeed!!! I'm 44 yrs of age and still suffer from cystic acne. It can be mentally debilitating having a condition that starts in the teenage years and still persists today. My problem seems to be hormonal. It has improved over the years but I have now accepted that I'm not going to 'grow out of it one day'. It can be hurtful when people ask if I have eaten too much chocolate etc when I have a break out. In this photo I have some on my forehead which my hair helps to hide and I have the red healing scars of 2 recent cystic acne on either side of my chin in the smile crease line. I was previously using a tinted moisturiser with sunscreen but felt this was also contributing to blocked pores. I discovered Mineral Hygienics recently and I'm very impressed with the product. It doesn't feel or look caked on. I like how it covers but still manages to keep a 'natural' look. In my photo you can still see a couple of sunspots (or as the doctor told me age spots!) on my cheeks. I used the Under Eye Multi Tasker for the dark circles under the eyes and on the red acne healing scars on my chin and acne on my forehead. I then used the Foundation and needed to apply a second application of the Multi Tasker on my chin area. I applied the foundation again with lots of buffing and it all blends in beautifully. The enlarged pores on my nose are dramatically reduced. I especially like how the product still looks fantastic at the end of the day. I definitely feel more confident with this product with it's ability to cover acne and redness without it looking like lots of coverup has ben appled. I'm also very happy with the service of the company promptly answering my questions with helpful advice.